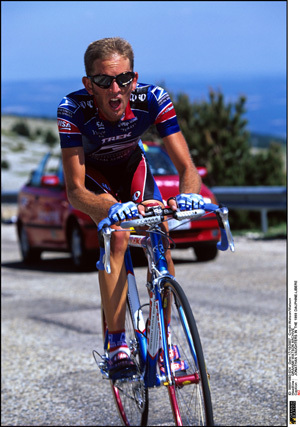 The Garmin team manager wrote this short article for the August 1999 edition of Cycle Sport. On his request, we have re-run it here. This is one of the many common experiences cyclists share – pros and cat-five riders alike. Along with fixing flat tyres, running out of food, dreading rainy days, and the looks of those not acquainted with Lycra clothing, the Tour is something we can all relate to on some level or another. While speaking to a friend of mine, a weekend warrior back in Colorado, I was reminded of how many parallels we share. He was speaking to me about how a race in Colorado ended due to some controversy over the centre line rule – one of many odd and obscure rules all of us who race in the US have to deal with. The centre line rule simply states that you may not cross the centre of the road while racing – 50 per cent of the road for racing, 50 per cent of the road for cars. This makes sense, I suppose, as oncoming traffic is dangerous for the riders, and closing roads is difficult these days. Well, back in Colorado we have quite a few races incorporating the centre line rule. We have quite a bit of wind in the mountains, so, as you might except, sometimes, to get a proper drafting effect riders sneak over the yellow line. Illegal and unsafe as it is. Soon enough, the other riders notice the advantage gained by those drafting on the sheltered side and also start to move across. All of this is very much against the rules but riders think, “if they’re doing it, I better do it too, else I’ll be dropped in the crosswind.” Being competitive in nature, bicycle racing attracts people who want to win. Soon enough, race officials come and lash out warnings from their motorbikes. For a time it works, but a few here and there sneak across, then more, then all. This situation escalates and the officials start to give out penalties. To whom? Only the ones they see. If you can get away with crossing the line you won’t get a penalty. So everyone is going across from time to time. Once more, most of the field has crossed the line. Now cars have to pull off and dangerous situations arise. Motorists are angry. The public is angry with cycling. So, as the race rounds a bend a police car pulls in front. The race is stopped by stern-looking policemen, wanting to know why cyclists can’t obey the law.